I'm so excited, I have been quite the little scrapper lately! I finally feel like I'm starting to come out of this very long scrapping rut that I have been stuck in. YAY! I have actually done almost four layouts this past week. To some that isn't much but most of you know that I am not by any means and "fast" scrapper, I'm ridiculously slow!! I am thinking of starting to add weekly challenges to my blog. One to challenge myself and keep me going and two to have some fun with my scrapping friends and see if anyone takes me up on my challenges!!! Have to share that I got happy mail last week....a box of scrapbook stuff from MemoryWorks. My favorite in that delivery??? MY NEW HEIDI SWAPP DATE STAMP. I know I am sooo behind because these have been around for a while now, but I just finally got both the print and the script ones and well frankly they just make me happy!!! 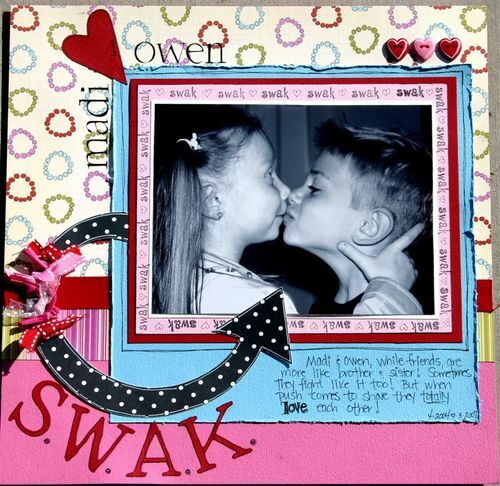 I have to finish the journaling on the layout that I just used it on and then I will share!!! But for now here are the ones I have finished! My boys each play so differently and I wanted to record how play looks differently to each of them! I have a set of photos that were taken a couple of years ago of Madi and Owen smooching....it was funny because at one point she actually tackled him to the ground! I love this one where she's got a hold of his head....like yeah, just try to get away!!! Coopie is my kid who loves to get his picture taken. He often asks me to take his picture. These were pics were taken I think in early spring of 05! Alot of times we have to go through a series of silly faces and poses in order for me to take the one that I want to take, but that's a compromise I'm willing to make!!! This is a layout I did last month and I liked it and wanted to share! I still need to add the date to it, but I am going to leave it as is...no journaling (I can hear the gasps!) but I'm ok with no journaling because as they say "a picture is worth a thousand words"! Enough said! And for the most part I am a big journaler so to not journal is a little out of my box!! Thanks for letting me share! So anybody up for a challenge??? If you are at all interested in me starting to post some challenges, like maybe once a week, let me know!!! I think it would be fun!! What a fun night last night...at least I thought it was fun. Had a group of girls over last night to scrapbook. Let's see it was Hope, Shannon, Keri, Lisa, Carla, Ann and myself. I was very disappointed that the weather hindered one friend from coming...Wendy was to be there and I was so looking forward to having her but that stinkin' snow!!! I had also invited another girl that I know from the scrapbook store, Kelly, but she wasn't able to make it due to previous plans. Next time!!! Anyway, it was a good night, with yummy food...Carla made chicken puffs which have to be on my top 5 favorite food list, Lisa (well actually Adam;-) made artichoke dip, which is another top 5 on my appetizer list, and Shannon made brownies, which I didn't have, but since there were leftovers that she let me keep, I will be indulging later. And Keri made Symphony brownies which were outstanding, can't wait to get that recipe. Anyway, it was a fun night and I'm so glad those who came made it. AND I think I might have officially been able to break out of the awful scrapper's block that I have had for the past 10 months or so. 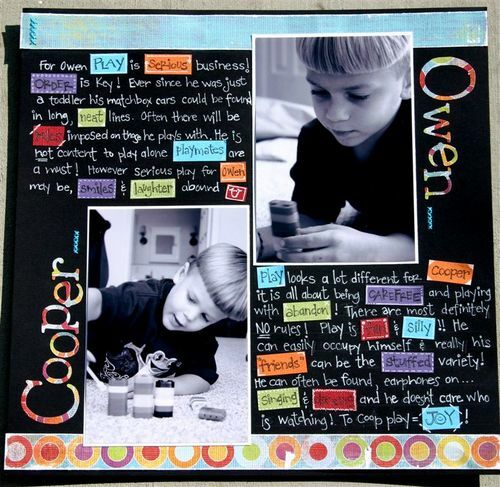 I was really getting worried that I may never be able to scrapbook again! This is no joke, I'm 100% serious when I say that. If you know me, you KNOW that I LOVE scrapping I have all this creative energy pent up in my head but then everytime I sit down, NOTHING, a BIG, FAT NOTHING!!! Some of you may think this is ridiculous and a very silly thing to be frustrated over, but to me its not. I've talked to God on more than one occasion about this because He understands the things that we care about. I truly believe that He made me a "creative" person, not as creative as some, but creative nonetheless and since I know He cares about me, I know He cares about me being able to use the creativity that He gave to me. ANYWAY....all that to say that I'm thankful that maybe, just maybe I may be seeing the light at the end of my proverbial tunnel as far as scrapper's block goes. So now that Emma is napping, after I finish my post, I am going to go scrap for a little while!!! Wish me luck!! After Emma's nap we are planning to go to Texas Roadhouse for lunch...YUM...a favorite eatery of ours and we haven't been there in a LONG time. I'm hoping for a quick stop into a few outlet stores after we eat. Have a happy Saturday!!! I'm doing a little California dreaming today and have been all weekend. This is because scrapbooking's biggest unveiling event has been taking place all weekend right up until tomorrow! CHA Winter is where I would love to be, and hey can't beat the location either!! If you want to catch up on some of what the different companies are up to and what you can expect to see in stores over the next few months...check out www.lifetimemoments.com and go to their trade show forum where they are constantly posting new updates from the show!!! Someday I'm gonna go!!! Anyway, I decided to pick a few of my favorites and link directly to them on Lifetime Moments! Here's the first Love, Elsie is Elsie Flannigan's new line. She's teamed up with KI to bring some fun new things to their company! And from France a great new line Rouge de Garance. Love the projects they had hat their booth! 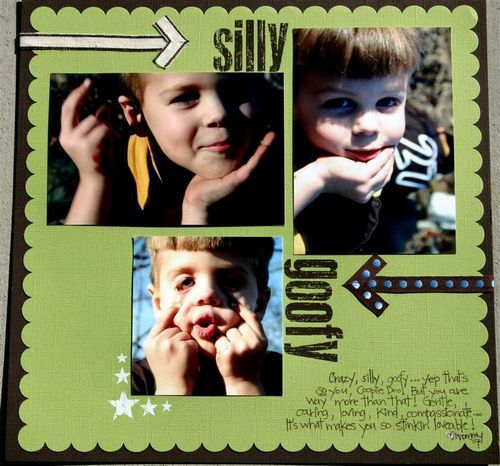 Love the albums from We R Memory Keepers! New from Autumn Leaves...my favorites from them are...Rhonna Farrer French Twist line...love the yummy girly colors!! 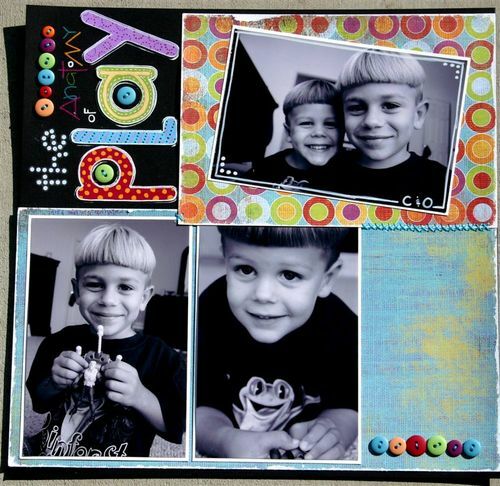 The cool overlays from Jackie Eckles...talk about an easy scrapbook page! All the new clear stamps but especially the journaling panels, what a great way to add journaling to your page and last but definitely not least the new QUOTE UNQUOTE "5"!! I love those quote books! 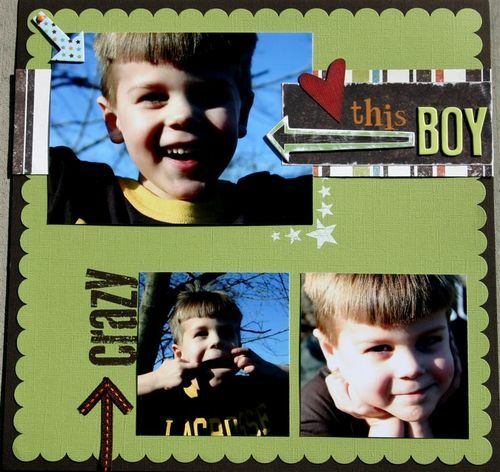 Love the great new chipboard books from Melissa Frances. Aren't they cute? Never really was much into Scrapworks but that may all change. Look at all those great goodies. Love the shimmer chipboard alphas!!! Creative Imaginations...Great stuff. I love their BE (Bare Elements) stuff. They have the coolest stuff to alter and they make great gifts!!! Love, Love, LOVE...KI Memories. They have always been a favorite of mine and now look at the great new clear stamps and the awesome felt stuff! Great new papers from Junkitz! Some great layouts from My Mind's Eye! RAZZLE, DAZZLE, BAZZILL always have and always will LOVE BAZZILL!!! They bring the foundations for all of my layouts....what would my scrapbook world be without the amazing colors and textures of Bazzill cardstock???? Fancy Pants has some great new papers and stamps AND they have some awesome layouts that can really get your creative juices flowing!! Another all time favorite....Making Memories! Love those albums!!! Check out the awesome spinny album thing by 7 Gypsies! And one last company to check out....FOR NOW.....Basic Grey!!! AWESOME new stuff from them. Love the paper as always and check out the new precision files they have, great for all those little corners and edges when decorating chipboard, etc. A definite must have!! Well I think that I've given you enough to look at for now. I'm sure Lifetime Moments will love me for sending you their way. Remember they'll have lots of this stuff in the coming months!! I love that they have all of these photos straight from the show, kinda makes me feel like I'm there!